Provide rich display of file and folder information from within your applications. ExFileView is a component for creating Windows Explorer-style functionality. The ExFileView library lets the user changes its visual appearance using skins, each one providing an additional visual experience that enhances viewing pleasure. Skins are relatively easy to build and put on any part of the control. note The eXShellView and eXFolderVew controls adds Windows-Explorer functionality ( with the same look and behavior as your Explorer ) to your forms. The main difference between eXFileView and eXShellView or eXFolderView, is that eXFileView can customize groups of files or folders with specified colors, fonts or icons, and the eXShellView and eXFolderVew uses the Windows system to create the views, and so the look and behavior is exactly like you would run your Windows Explorer in your form. Files or folders with different attributes can be displayed with different color, background color, font, etc. Search files and folders support. Ability to display the results from a recursive search. Filter the files based on files extensions using Include or Exclude clauses. Ability to filter files and folders on the fly, using the control's filterbar. Ability to define custom filter patterns for any column. OLE Drag and Drop support. 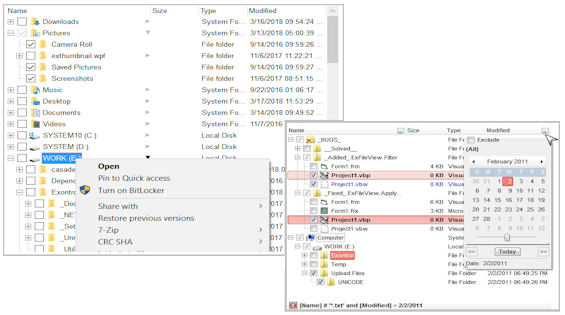 eXShellView Exontrol's new ExShellView component provides a file list view which is identical with the right pane of your Windows Explorer. eXFolderView Exontrol's new ExFolderView component provides a folder tree-list view which is identical with the left pane of your Windows Explorer. eXThumbnail The Exontrol's eXThumbnail component provides thumbnail views for your files. Thumbnails are reduced-size versions of pictures or shell items, used to make it easier to scan and recognize them, serving the same role for images as a normal text index does for words. eXMiller The eXMiller component is a file-folder-view component that uses miller columns visualization to display system folders and files. The Miller columns (also known as Cascading Lists) are a browsing/visualization technique that can be applied to tree structures.